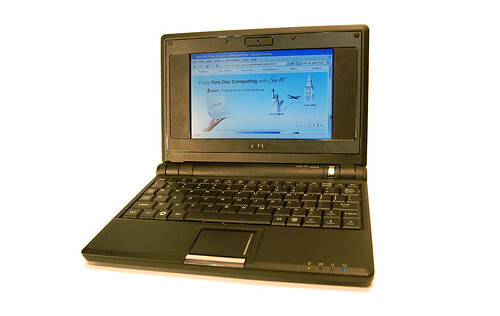 We can start with my first impressions of the Eee PC. Throughout the year the little computer has served me well. It’s almost always in my backpack and ready to use. Being just 2 pounds is a definite plus for something you always carry around. Lightweight is definitely a top feature. As for battery life, well… I really expected better. With wifi on, I typically see under 3 hours, which isn’t great, but again, small computer = small battery, so I can live with that. The power adapter isn’t too big, so I always carry that around as well. The battery does seem to drain more than it should in sleep mode, so I typically turn if off when not in use. As I wanted a unit that “just worked” (as much as a Linux computer can) I stuck with the default Xandros OS on it. I contemplated trying Ubuntu a few times, but things like “recompile the kernel for wifi to work” or other such warnings turned me off. Besides, for the way I use the thing, I didn’t think I’d see much benefit from a different OS. Posted on Saturday, November 29th, 2008 at 9:30 am. Subscribe to the comments feed. Both comments and pings are currently closed. Post on your own blog.